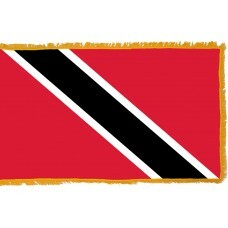 The Trinidad and Tobago flag features a red field with a black diagonal band beginning from the top left-hand corner and ending at the bottom right-hand corner. The black band has a white border. 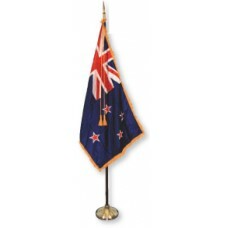 The red, black and white colors of the flag represent, earth, water, and fire. The red color (fire) represents the warmth of the sun and the friendliness, bravery and vitality of the nation and its inhabitants. The black color (earth) represents the dedication of the people and the unity, and the white color (water) represents the peace and purity as well as the sea that unites Trinidad and Tobago. 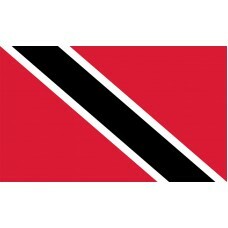 The Trinidad and Tobago flag was adopted on August 31st, 1962, when it gained independence from Great Britain. 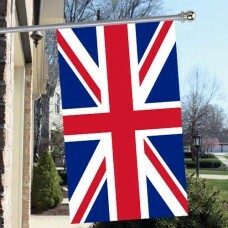 Prior to its independence, the Trinidad and Tobago Flag was a British Blue Ensign as well as the Union Jack. Trinidad and Tobago is a dual-island country (that is mainly mountainous) that is located in the South Caribbean Sea. It shares maritime borders with Barbados, Grenada, Guyana, and Venezuela. The capital city is called Port of Spain. The islands were separate territories until 1889 and were first settled approximately 7,000 years ago by the Archaic people and were referred to as "Land of the Hummingbird." This makes Trinidad and Tobago the earliest settled part of the Caribbean. When the islands first got discovered by the Europeans, Trinidad was inhabited by Arawakan-speaking groups, such as the Nepoya and Suppoya as well as Carib-speaking groups, such as the Yao, and Tobago was inhabited by Island Caribs and Galibi. In 1498, following Christopher Columbus's visit to the islands, they became a Spanish colony. During the following years, Trinidad and Tobago came under the control of the British, French, and Dutch until they were ceded to Great Britain in 1802 by the Spanish. In 1889, the two islands were combined and formed the colony of Trinidad and Tobago. Trinidad and Tobago remained under British control until they gained independence. Trinidad and Tobago is considered to be one of the wealthiest and most developed Caribbean countries. The economy is heavily reliant on the petroleum industry and tourism is now becoming a high contributor to the nation. The biggest tourist attraction in Trinidad is called "Pitch Lake" and it attracts approximately 20,000 tourists a year. Pitch lake is the largest natural deposit of asphalt in the world. Speyside is another popular attraction and is where the biggest brain coral (coral that has a surface that resembles a brain) in the world can be found and is renowned for its diving and snorkeling spots. Both Trinidad and Tobago are known for their beautiful beaches with crystal clear waters. The most well known one in Tobago is Pigeon Point Beach and Maracas Bay is the most famous one in Trinidad.